Over 350 U.S. newspapers published articles on Thursday decrying President Trump’s attacks on the media, drawing a predictable retort from the White House. A coordinated effort by the news industry to explain why people should pay for their product might be more effective. 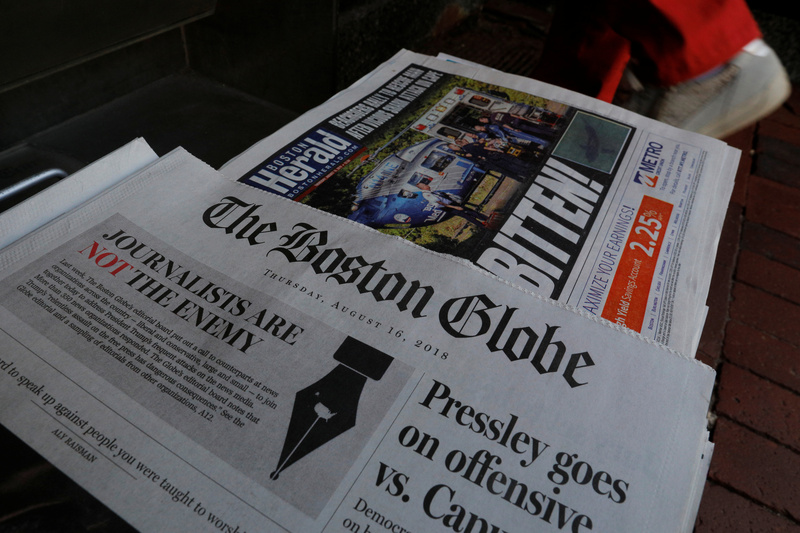 A customer walks past the front page of the Boston Globe newspaper referencing their editorial defense of press freedom and a rebuke of President Donald Trump for denouncing some media organizations as enemies of the American people, part of a nationwide editorial effort coordinated by the Boston Globe, at a newsstand in Cambridge, Massachusetts, U.S., August 16, 2018. More than 350 U.S. newspapers including the Boston Globe, the Arizona Daily Star and the Idyllwild Town Crier published editorials on Aug. 16 criticizing President Donald Trump’s attacks on journalism. “The slander of ‘fake news’ has become Donald Trump’s most potent tool of abuse and incitement against the First Amendment, labeling journalists the ‘enemy of the American people’ and ‘dangerous and sick.’ This dirty war on the free press must end,” said the American Society of News Editors. The push was organized by the Boston Globe.